This was my third book for Foodie's Reading Challenge, which means that with my target of five books, I am over halfway there! :P This is the first food book I've read in a long time that wasn't a memoir. It was told in first person, but not invasively so. Schlosser's comments popped up occasionally, but he often used a more journalistic tone during the 'expose' segments of the book. While it is clear where Schlosser's opinions lie (even before the epilogue where he explains what changes he would like to see in the industry), he doesn't quite beat the reader over the head with them (until, again, the epilogue). The way he presents his discoveries make it clear as to what opinion the reader should form, so it's not necessary for him to spout his own conclusions. It's important, however, to remember that this book is ten years old. It isn't quite the big revelation that it might have been at the time. I wasn't shocked by anything I read, although I was thoroughly disgusted. It's embarrassing and awful and terrible what greed leads people to do. It's also fascinating to see how much of an impact politics have, and how things can change so drastically when the power of the US government switches parties. I wonder how things have changed since this book was first published (and as a Canadian, I wonder how the situation in the US compares to the situation here). 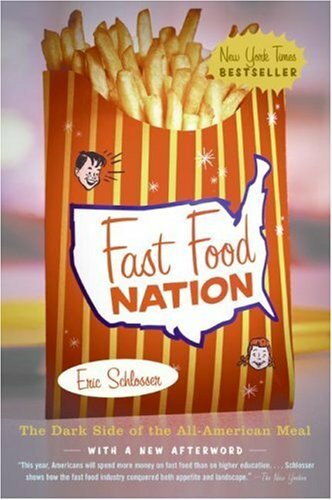 I recommend this book if you eat fast food often, or even just a little more than you should. Hopefully it will encourage you to change your habits for the better!